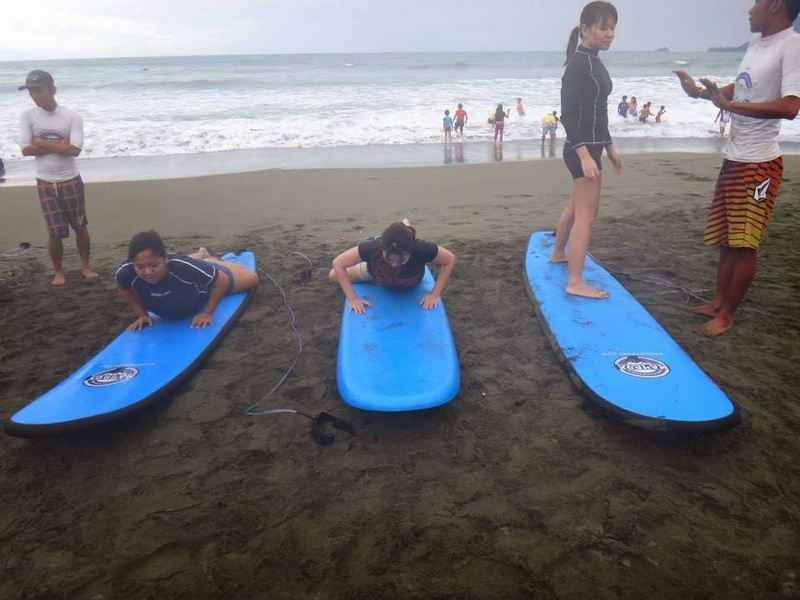 If our day 1 consisted of a full-blown tour of Baler, day 2 was focused on 1 thing: surfing. Because I thought, if worse comes to worst, then I'll just make a run for it and hide my face all through out until I get to our room. Chances are, I won't be seeing all these people anyway. Ha! So I will surf today. I was so ready with my surfing gear for this trip but due to some challenging circumstances (*cough* period *cough*), I had to do some adjustments with my clothing just to make sure everything is 100% secured. It was the weekend where in there was no sun, so cloudy weather and high waves greeted the four of us as we made our way to Mahdox Surf school. According to the instructors, the tides were high that morning. I guess surfers prefer it that way, although for beginners like us, this means wilder and higher waves. Eeeeep! 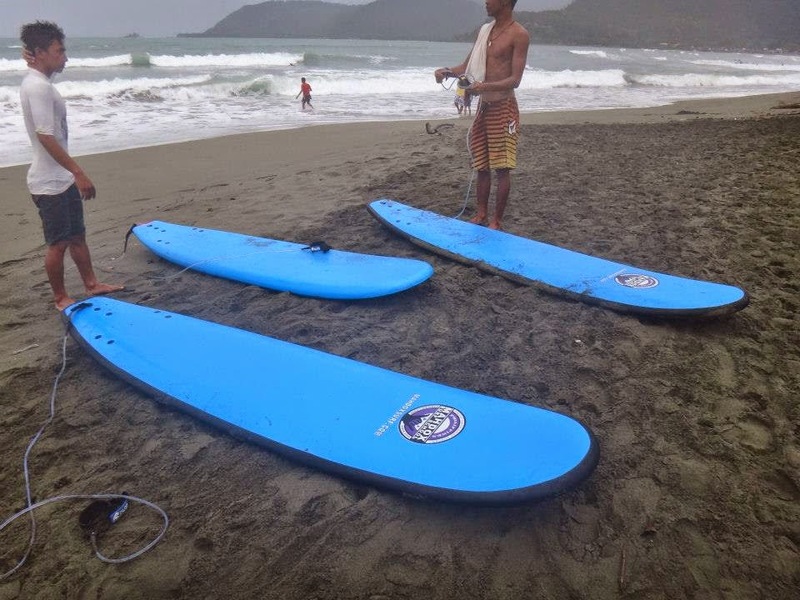 The waves were so wild that morning that even though I thought my gear – complete with a swimming top underneath, rash guard and shorts – was already secured, there was one wave that crashed against me so hard, my rash guard and my swimming top rode up. It was only minutes later, when my instructor and I were already standing by the shore, that my instructor told me, “ma’am, pakiayos nalang po muna yung damit nyo… (miss, please fix your clothes first) and it was only then that I realized that my swimming top already rode up all the way to a place it shouldn't be… Gaspppp! Wardrobe malfunction in the ocean! Baler style! So I quickly fixed it, half embarrassed and half laughing at myself. Kuya instructor seems to be more embarrassed than me though, because he said that without looking at me.. Ha! Good thing he would be one of those people I won't be seeing for long. Needless to say, I didn't get to stand on the surfboard that day! L Actually, the best that the four of us could do was kneel. We teased each other later on that kneeling is the new surfing pose. The instructors were very patient but 30 minutes into it, and the four of us have already given up and were already more comfortable sitting by the shore, telling the instructors to go at it with the waves just to kill time. “Sige nga kuya, pakita naman, kayo naman magsurf..” Haha! Pasasaan ba’t matatapos din ang 1 oras diba?? :P Haha! Ohwell, I really need to exercise and get into fitness because I did feel weaker this trip, no body strength to push my whole body up, stand and balance myself on the surfboard. So if there were two realizations, it would be: (1) the frequency of checking your clothes should be proportionate to the size of the waves (2) exercise weeks before you surf. For the next post, let's move to a topic where in waves or no-waves, there would be no stopping me from diving into - food!! !